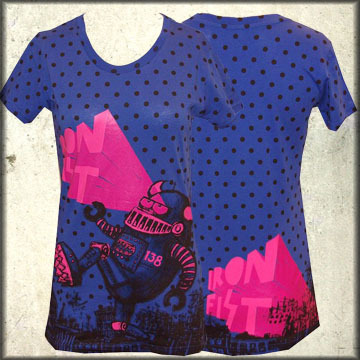 Iron Fist We Are 138 short sleeve womens t-shirt features black polka dot print all over the front and back with a robot towering above a city on the front projecting the Iron Fist logo in pink. 100% cotton, junior's fit. Color: cobalt blue.